It was reported earlier that Anirudh has taken up the responsibilities for the background music from Harris Jayaraj, bringing in a sudden twist to the Irandam Ulagam tale. 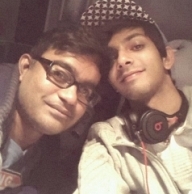 Well, the latest news is that director Selvaraghavan and Anirudh are off to Budapest, Hungary to record the symphony for the movie’s background score. The BGM work is happening in rapid pace and the team is looking to wrap things up by the 8th of October. It is said that Anirudh has already jotted down the notes for the score that he is going to record in Budapest, so that they will be able to finish up things faster. It should be noted that movies like Hey Ram and Anjali, scored by Maestro Ilayaraja have made use of the Budapest Symphony at Hungary. With the team looking at completing the re-recording by the second week of October, the likelihood of a Diwali release is still on. Will Anirudh Take Up Acting After His Performance In The Chicken Song? People looking for online information on Anirudh, Irandam Ulagam, Selvaraghavan will find this news story useful.